Moms might be different, but I don't think dads can really know what type of parent they will be .. until actually faced with fatherhood. I mean, certainly we all aspire to excel at one of life's most important roles .. but until we put hand to task, our preconceptions represent little more than wishful thinking. A friend told me yesterday, "I always knew you'd be a good dad -- an *excellent* dad -- but you have exceeded even my expectations." "I just knew," he answered, declining to elaborate. The Back Bay is where I usually go after I give the Bug back to his mom, and can't see him for several days. Hiking in nature helps me process the feelings of loss that come from missing him. There I saw a bobcat .. my first-ever out in the wild. Strikingly beautiful animal. Dark colors. Pointy ears. He did not seem alarmed by crossing paths with a human, passing within 15 feet (5 meters). A lady following some distance behind said he was one of three offspring born several months ago, and that the mother-bobcat was much lighter in color. I know it sounds corny, but the sighting made the day feel special .. like when I spy dolphins, or a whale. Sometimes, after I give the Bug back, it feels like my heart is ripped apart .. but this week was different. I felt *good* .. a sense of accomplishment .. satisfied I had done a good job, and content he was happy and developing well. 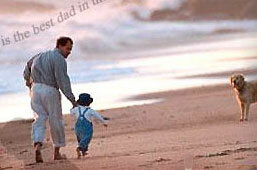 Continue reading What Type of Dad Will I Be? A Rad Perspective on Fatherhood.